WOULD YOU BUY AN OLD SAILBOAT AND DO IT UP? She’s a 49′ steel ketch, designed by Colin Childs. So if you’re looking for a boat project and are not shy about boat maintenance, you will enjoy our tour. 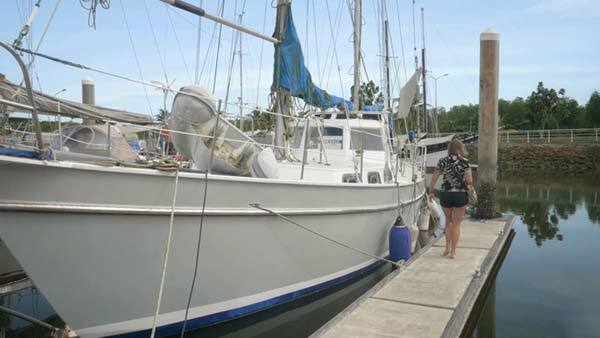 A “do-er upper”, for sure, which could be the perfect sailboat for someone looking to become a liveaboard cruiser. Sadly, over the years we have come across many such cases of boats semi-abandoned in marinas around the world. They were once a big part of the owner’s dream, but circumstances mean they are no longer able to continue. Quite often they can be sailed away, like this one, but usually they need a bit of work. We would suggest that Sea Quest might need to be re-rigged, possibly new sails and the electronics would need an overhaul. Down below the decor is tired, but the layout is superb, really spacious. And there’s a washing machine! The mini refit continues at Krabi Boat Lagoon Marina, with Ton getting to grips with bending and fixing into place the new rain-catcher for the hard dodger roof. In the video, he gives us a lesson in how to bend wood. His expertise continues to impress us. We love Ton – in fact Jamie has admitted to a small man-crush on him! TON BENDS WOOD LIKE BECKHAM BENDS BALLS! And while Ton is getting on with the dodger, our painting team are making great progress with the deck and topsides. They have filled and fared all the marks, holes and dents, and have begun applying the undercoat. Jamie finds a real b*****d of a job to do around the cockpit, involving some tricky access from below decks. But first he has to hunt for the chuck key to his drill, because it isn’t in the place where it lives… Luckily Ton was on hand to help, while our old standby, butyl tape, comes to the rescue for sealing the fittings. Her father is not doing so well, and at 91 has gone into full-time care, so she is taking a few weeks off to spend time with him. Of course, this means leaving Jamie behind to do all the work. As always, thank you so much for your fantastic support! That steel hull has a lot of potential for sure but as a solo sailor it is not something I would even consider. My Albin Vega 27 is super tiny compared to your sailboat and the Sea Quest but I love my little girl. We have a love/hate relationship that has carried me safely across many oceans. I have been based in the Philippines since 2007 and have seen many sailboats like the Sea Quest that have more or less been abandoned. It really is a shame to see what were once beautiful boats withering away. I have seen quite a few that have eventually been scrapped out and it brings a tear to an old sailors eyes.